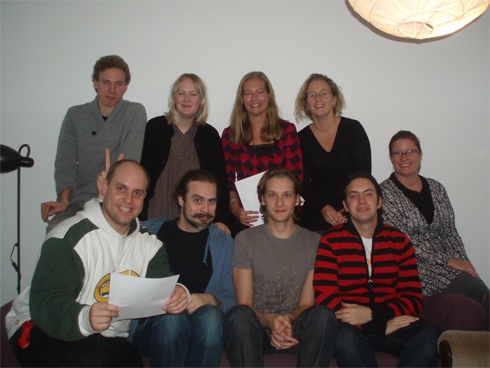 The 17th of november 2007 SWYAA Sweden held their annual general meeting. A lot of members gathered at Fredriks apartment in central Stockholm to discuss SWY-matters. Some of them who couldn´t make it in person were present for phone conversations. After the many hours of meeting the members enjoyed a taco buffé and after that dancing shipstyle at the classic Södermalm joint Kvarnen. In the photo, standing from left: Gustaf Rindler, Jenny Jonstoij, Ulrika Johansson and Jenny Magnusson. Sitting, from left: Fredrik Quistbergh, Wiktor Södersten, Patrik Vulkan, Daniel Schatz and Lotta Rössner.